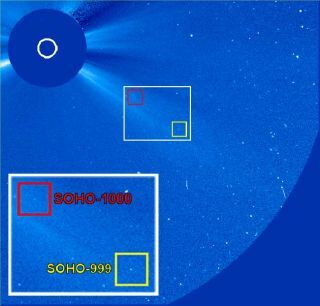 SOHO comets 999 and 1,000. The best comethunter in history recently spotted its 1,000th comet, accounting fornearly half the comets ever discovered. The Solar and Heliospheric Observatory (SOHO), which is run by NASA andthe European Space Agency, was designed to watch the Sun, but has since provedto have excellent ability at spotting comets. The imagesSOHO took were posted to the internet and amateur sky-watchers had theopportunity to find and report new comets. Amateurs were finding comets soquickly that SOHO operators decided to make a contest of it, awarding a prizeto the person who discovered the 1,000th comet. Italian highschool teacher Toni Scarmato got lucky on Aug. 5 andspotted comets numbers 999 and 1,000 in the same SOHO image. "I am veryhappy for this special experience that is possible thanks to the SOHO satelliteand NASA-EVA collaboration," Scarmato said. "I wantto dedicate the SOHO 1000th comet to my wife Rosy and my son Kevinto compensate for the time that I have taken from them to search for SOHOcomets." For hisaccomplishment, Scarmato will receive a SolarMax DVD, a SOHO T-shirt, solar viewing glasses, andmore. A second SOHOcomet-spotting contest awarded prizes to Andrew Dolgopolovof Ireland for the closest guess - within 22 minutes - of when the 1,000thcomet would be spotted. The SOHOspacecraft was engineered to watch solareruptions and the ensuing space weather that sometimes bombards Earth. But early onin the mission, armchair astronomers figured out they could become cometdiscoverers using SOHO images posted to the Web. Because SOHO is trained onthe Sun, it only sees comets that whiz by the Sun, called Sun grazers. Sun grazersare often hard to spot because they are lost in the glare from the overwhelminglight produced by the Sun. But SOHO is equipped with a device that blocks lightfrom the Sun's main disk so detailed images can be made of the solar atmosphereand surrounding space. "BeforeSOHO was launched, only 16 sun grazing comets had been discovered by spaceobservatories," said Chris St. Cyr, senior project scientist for NASA's'Living With a Star' program at the agency's GoddardSpace Flight Center. "Based on that experience, who could have predictedSOHO would discover more than 60 times that number, and in only nineyears." Some 85percent of all SOHO comets belong to the Kreutzgroup, named because their orbits take them within 500,000 miles of the Sun'svisible surface. Some make a trip around the Sun and head back out to the farreaches of the solar system on wildly elongated orbits. Others don't make it,being gravitationally drawn rightinto the star on close approach. Other cometsdiscovered without SOHO, such as one named Kudo-Fujikawa,have at times been watched in realtime by web surfers as they dramatically sliced across SOHO'sfield of view. In 2003, a comet named NEAT, whose path in front of the SOHOcameras was well predicted, was smacked by asolar storm, the first such event ever recorded. SOHO is ajoint effort between NASA and the European Space Agency. It has accounted forabout half of all comet discoveries, through history, in which orbits have beencalculated.